﻿ Airbag Module Reset - Clear Your Airbag Light! Here at Safety Restore, we constantly get phone calls with our customers starting off their sentences with "My airbags deployed and now my airbag light is on. How do I reset it?" Looking for a simply solution to simply get the airbag light off for their peace of mind or to pass an inspection. The problem is, the solution shouldn't involve around getting he airbag light off from your dash. Why? Because the airbag light is simply an indication of something going wrong. It is triggered by an SRS airbag computer that stores all SRS airbag related data. It is the codes and messages that are important and require attention! And of course we are here to focusing on the issues that involve your safety and are dedicated to providing a safe and reliable SRS airbag module reset service! When a car has been in a crash, major or minor, the event happened with your SRS computer being fully involved triggering all SRS components. This includes the crash sensors, all airbags, seat belts: retractors, pretensioners & buckles as well as the SRS unit itself. So what exactly happened? Well depending on the collision and its location (e.g. Front, side, rear) the vehicle is equipped with crash sensors that detect the impact. Not only the fact that a collision took place, but the strength of the impact and capacity. This trigger is passed on to the SRS computer that determines what needs to happen next. Whether the crash is sever enough for the airbags deploy, and if so - which ones. This also determines which seat belts are to be deployed. This happens extremely fast in order to protect the occupant. However once it does - the SRS components will no longer work properly, until repaired or replaced. That is where we come in with our SRS airbag module reset service. Our SRSmodule reset service is fast and affordable, but more importantly - safe. We will only reset your airbag module it it can be safely restored to factory condition and will be guaranteed to work during an accident. 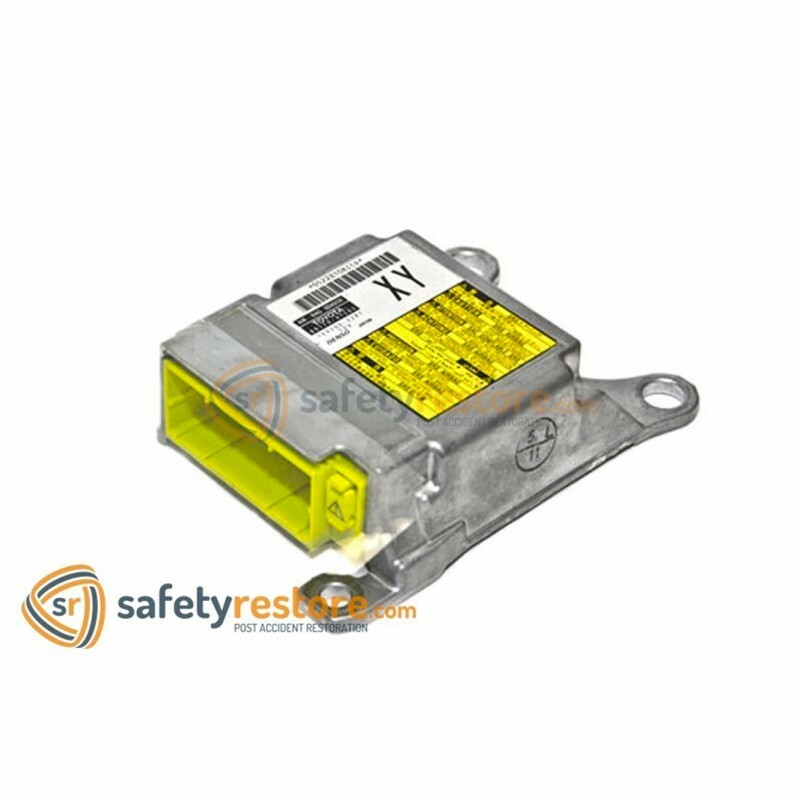 This is where safety restore is separated from the competition - many companies will simply reset the SRS airbag module just to get the light off, regardless whether it will work again or not. Safety is always our #1 priority and that is why it is the first word of our name. We will never compromise safety in any of our repairs, and if it ever comes down to that - we will always refund your money over carrying out an unsafe repair. How do I remove the airbag module? Even though every car is different, the procedure is similar throughout all models. The location of the SRS unit is almost always under the center console, under the dash in the pedal area or under the driver's seat. We recommend disconnecting the battery whenever working with any SRS components. You may need to remove trim, bolts/screws and wiring. Will I need any further programming? Most of the time - no. When we erase crash data and hard codes, we assume that all of your SRS components are either repaired or replaced and resetting the airbag computer was your last step. Whoever, if you missed something - such as replacing a bad crash sensor, clocksprinng, seat belt or airbag, the airbag light will come back up. You will need to fix that issue first. In addition, some soft codes may not have been erased and you will need to use an airbag reset tool to get those erased. How do you reset the SRS module? SRS airbag modules are computers with electric boards with chips rest resemble a computer. We work with one part of the module and that part only. It is one chip that stores data known as the eeprom chip. This chip is where all of your crash data and hard codes are stored. We use our tools to read the data and analyze it. We then use OEM programming to compare the data, erasing all faults to reprogram the chip to pre-crash condition. We then write this "new" or "original" data back to your module. We do not touch or work with any other parts of the module for safety reasons. The work involves minimal hardware and for the most part cannot affect anything. Safety Restore is the leader in post accident restorations with thousands of customers ranging from individuals to mega dealerships that trust us with all of their SRS airbag module reset needs. We offer low prices and an incredibly fat service! We understand that this line of work is time-sensitive and that is why we offer a lightning-fast 24 hour service. You'll also get your part back with our fast shipping! Remember that we reset your original airbag module and do not replace it. This is the best alternative to buying new airbag modules from the dealer, saving you hundreds to thousands of dollars! Order your Srsmodule reset service and save now! We're here to help! Call us at 855-552-7233 M-F 9-8 EST or email us here.